Reading and share top 53 famous quotes and sayings about Wretchedness by famous authors and people. 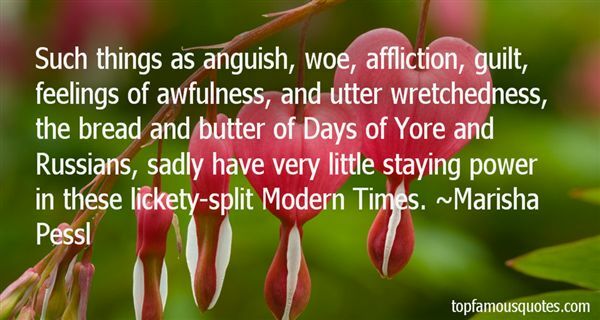 Browse top 53 famous quotes and sayings about Wretchedness by most favorite authors. 1. "Come, then, thou regenerate man, thou extravagant prodigal, thou awakened sleeper, thou all-powerful visionary, thou invincible millionaire,--once again review thy past life of starvation and wretchedness, revisit the scenes where fate and misfortune conducted, and where despair received thee. Too many diamonds, too much gold and splendor, are now reflected by the mirror in which Monte Cristo seeks to behold Dantes. Hide thy diamonds, bury thy gold, shroud thy splendor, exchange riches for poverty, liberty for a prison, a living body for a corpse!" 2. "The most durable monument of human labor is that which recalls the wretchedness and nothingness of man." 3. "When the serpent breathed the poison of his pride, the desire to be as God, into the hearts of our first parents, that they too fell from their high estate into all the wretchedness in which man is now sunk. In heaven and earth, pride, self-exaltation, is the gate and the birth, and the curse, ofhell." 4. "Humility exalteth man to the heaven of glory and power, whilst pride abaseth him to the depths of wretchedness and degradation." 5. "Jane felt that he would write from the depths of a wretchedness that would not necessarily be insincere because its outward signs were so theatrical. 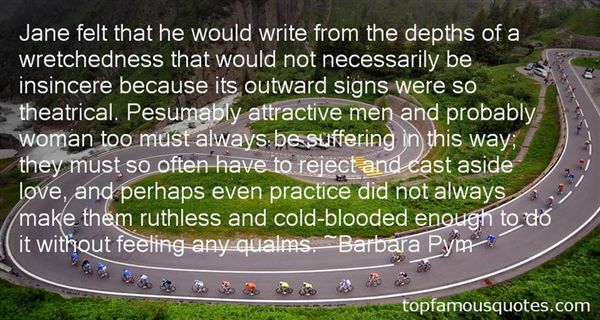 Pesumably attractive men and probably woman too must always be suffering in this way; they must so often have to reject and cast aside love, and perhaps even practice did not always make them ruthless and cold-blooded enough to do it without feeling any qualms." 6. "I just loved being divorced from my own wretchedness." 7. "The true religion would have to teach greatness and wretchedness, inspire self-esteem and self-contempt, love and hate." 8. "Unless we know ourselves to be full of pride, ambition, concupiscence, weakness, wretchedness and unrighteousness, we are truly blind. And if someone knows all this and does not desire to be saved, what can be said of him?" 9. "Knowlege of God without knowledge of man's wretchedness leads to pride. Knowledge of man's wretchedness without knowledge of God leads to despair. Knowledge of Jesus Christ is the middle course, because by it we discover both God and our wretched state." 10. "The peoples of civilization see their wretchedness increase in direct proportion to the advance of industry." 11. "But she insists the family hadn't a choice. Not true. We always have choices. Isn't that what Dante teaches us?I really have become quite the Dante scholar: "There is no greater sorrow than to recall our time of joy in wretchedness." 12. "In general, from the violation of a few simple laws of humanity arises the wretchedness of mankind - that as a species we have in our possession the as yet unwroght elements of content - and that, even now, in the present darkness and madness of all thought on the great question of social condition, it is not impossible that man, the individual, under certain unusual and highly fortuitous conditions, my be happy"
13. "Her carriage bespoke an exquisite misery, a wretchedness so perfect and so absolute that it manifested as dignity, as calm. More than a dark horse, she was darkness itself, the cloak of it." 14. "There was a leap of joy in him, like a flame lighting up in a dark lantern. At this moment he believed it was worth it. This moment of supreme beauty was worth all the wretchedness of the journey. It was always worth it. "For our light affliction, which is but for a moment, worketh for us a far more exceeding and eternal weight of glory." It was the central truth of existence, and all men knew it, though they might not know that they knew it. Each man followed his own star through so much pain because he knew it, and at journey's end all the innumerable lights would glow into one." 15. "Once the principals in their party are seated, with those lower on the totem pole left to grumble and move on to find another table, our once-cozy booth transforms into a damp fusion of vacuous wretchedness, with the three women all complaining alternately about their wet hair/clothes and their respective distance from Talon, while the man himself is trying to maneuver his Paul Bunyan frame way too close to me." 16. "How evil life must be if it were indeed necessary that such imploring cries, such cries of physical and moral wretchedness, should ever and ever ascend to heaven!" 17. "I find myself acting differently with God. Often, when I pray, I will phrase my sentences in a way that makes me sound better. I will try to soften my sins, or touch up my true feelings before laying them before God. How foolish it is for me to be completely honest with my wife about my shortcomings, but try to fool God! God wants us to be open with Him. He definitely doesn't want us to 'season our wretchedness' as we would raw meat. He knows what we are, that we are disgusting, that all we are doing is trying to make ourselves feel better. God desires a true intimacy with each of us, and that comes only when we trust Him enough to be truly transparent and vulnerable. People who are obsessed are raw with God; they do not attempt to mask the ugliness of their sins or their failures. Obsessed people don't put it on for God; He is their safe place, where they can be at peace." 18. 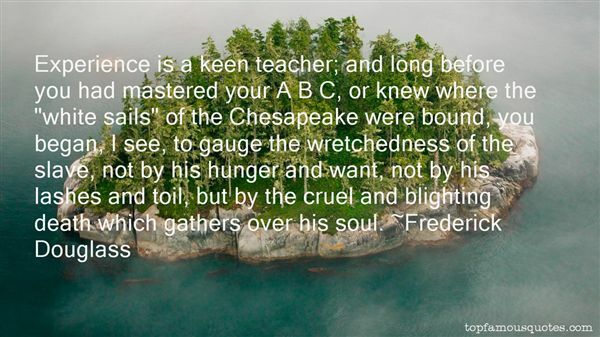 "Experience is a keen teacher; and long before you had mastered your A B C, or knew where the "white sails" of the Chesapeake were bound, you began, I see, to gauge the wretchedness of the slave, not by his hunger and want, not by his lashes and toil, but by the cruel and blighting death which gathers over his soul." 19. "To those human beings who are of any concern to me I wish suffering, desolation, sickness, ill-treatment, indignities—I wish that they should not remain unfamiliar with profound self-contempt, the torture of self-mistrust, the wretchedness of the vanquished: I have no pity for them, because I wish them the only thing that can prove today whether one is worth anything or not—that one endures." 20. "Raskolnikov was not used to crowds, and, as we said before, he avoided society of every sort, more especially of late. But now all at once he felt a desire to be with other people. Something new seemed to be taking place within him, and with it he felt a sort of thirst for company. He was so weary after a whole month of concentrated wretchedness and gloomy excitement that he longed to rest, if only for a moment, in some other world, whatever it might be; and, in spite of the filthiness of the surroundings, he was glad now to stay in the tavern." 21. "The feeling of intense repulsion, which had begun to oppress and torture his heart while he was on his way to the old woman, had by now reached such a pitch and had taken such a definite form that he did not know what to do with himself to escape from his wretchedness"
22. "I say, I can not identify that thing which is called happiness, that thing whose token is a laugh, or a smile, or a silent serenity on the lip. I may have been happy, but it is not in my conscious memory now. Nor do I feel a longing for it, as though I had never had it; my spirit seeks different food from happiness, for I think I have a suspicion of what it is. I have suffered wretchedness, but not because of the absence of happiness, and without praying for happiness. I pray for peace -- for motionlessness -- for the feeling of myself, as of some plant, absorbing life without seeking it, and existing without individual sensation. I feel that there can be no perfect peace in individualness. Therefore, I hope one day to feel myself drank up into the pervading spirit animating all things. I feel I am an exile here. I still go straying." 23. "I desire nothing, seek nothing but peace, the slumber of the soul. I have tasted all the hollowness and wretchedness of life and I despise it heartily. Whoever has lived and thought cannot but, in his soul, despise humanity. Activity, cares, worries, distractions - I am sick of them all. I wish for nothing, I seek nothing. I have no aim, for one gains that which one is eager for - and sees that it is all illusion. My joyous days have passed. I have cooled to them. In the educated world, amidst human beings, I feel the disadvantages of life too strongly, but alone, far from the crowd, I turn to stone. In this trance anything can happen, I see neither others nor myself. I do nothing and do not notice the actions either of others or myself - and I am at peace, I am indifferent. There can be no happiness for me, and I will not succumb to unhappiness." 24. "And unbidden, floating into consciousness came the truth of his utter wretchedness. Even the very earth seemed to cry out in pain. Hodburn Wood"
25. "Blessedness, not material possessions, is the measure of right thought; wretchedness, not lack of material possessions, is the measure of wrong thought." 26. "People are continually pointing out to me the wretchedness of white people in order to console me for the wretchedness of blacks. But an itemized account of the American failure does not console me and it should not console anyone else. That hundreds of thousands of white people are living, in effect, no better than the "niggers" is not a fact to be regarded with complacency. The social and moral bankruptcy suggested by this fact is of the bitterest, most terrifying kind." 27. "It is now expedient to give some description of Mrs. Allen, that the reader may be able to judge in what manner her actions will hereafter tend to promote the general distress of the work, and how she will, probably, contribute to reduce poor Catherine to all the desperate wretchedness of which a last volume is capable -- whether by her imprudence, vulgarity, or jealousy -- whether by intercepting her letters, ruining her character, or turning her out of doors." 28. "He shewed himself so intimately acquainted with all the tenderest songs of the one poet, and all the impassioned descriptions of hopeless agony of the other; he repeated, with such tremulous feeling, the various lines which imaged a broken heart, or a mind destroyed by wretchedness, and looked so entirely as if he meant to be understood, that she ventured to hope he did not always read only poetry; and to say, that she thought it was the misfortune of poetry, to be seldom safely enjoyed by those who enjoyed it completely; and that the strong feelings which alone could estimate it truly, were the very feelings which ought to taste it but sparingly...she ventured to recommend a larger allowance of prose in his daily study." 29. "They gave themselves up wholly to their sorrow, seeking increase of wretchedness in every reflection that could afford it, and resolved against ever admitting consolation in future." 30. "Far from seeking to justify, as does the Church, the necessity of torments and afflictions, he cried, in his outraged pity: 'If a God has made this world, I should not wish to be that God. The world's wretchedness would rend my heart." 31. "I have loved humanity, I have loved it so much. For me, there are three kinds of men; he who curses life, he who blesses it and he who contemplates it. I loved the first for his wretchedness, the second for his indulgence and the third for his perception." 32. "I've crossed paths since with men like him. I wish I could say differently. But I have. And what I have learned is that you dig a little and you find they're all the same, give or take. Some are more polished, granted. They may come with a little bit of charm-- Or a lot -- and that can fool you. But really they're all unhappy little boys sloshing around in their own rage. They feel wronged. They haven't been given their due. No one loved them enough. Of course they expect you to love them. They want to be held, rocked, reassured. But it's a mistake to give it to them. They can't accept it. They can't accept the very thing they're needing. They end up hating you for it. And it never ends because they can't hate you enough. It never ends-- the misery, the apologies, the promises, the reneging, the wretchedness of it all. My first husband was like that." 33. "The wretchedness of being rich is that you live with rich people. To suppose, as we all suppose, that we could be rich and not behave as the rich behave, is like supposing that we could drink all day and stay sober.-Logan Pearsall Smith (1865-1946) US-English essayist, editor, anthologist"
34. "Such things as anguish, woe, affliction, guilt, feelings of awfulness, and utter wretchedness, the bread and butter of Days of Yore and Russians, sadly have very little staying power in these lickety-split Modern Times." 35. "And when he awoke in the morning and looked upon the wretchedness about him, his dream had had its usual effect: it had intensified the sordidness of his surroundings a thousandfold." 36. "What misery to be afraid of death.What wretchedness, to believe only in what can be proven." 37. "Shall each man," cried he, "find a wife for his bosom, and each beast have his mate, and I be alone? I had feelings of affection, and they were requited by detestation and scorn. Man! You may hate, but beware! Your hours will pass in dread and misery, and soon the bolt will fall which must ravish from you your happiness forever. Are you to be happy while I grovel in the intensity of my wretchedness? You can blast my other passions, but revenge remains—revenge, henceforth dearer than light or food! I may die, but first you, my tyrant and tormentor, shall curse the sun that gazes on your misery. Beware, for I am fearless and therefore powerful. I will watch with the wiliness of a snake, that I may sting with its venom. Man, you shall repent of the injuries you inflict." 38. "Misery is manifold. The wretchedness of the earth is multiform." 39. "So this is pain. So this is wretchedness. So this is misery. I never knew. -Jack"
40. "The histories which we have of the great tragedy give no idea of the general wretchedness, the squalid misery, which entered into every individual life in the region given up to the war. Where the armies camped the destruction was absolute." 41. "Please don't give me words; give me a hug. Don't tell me that I'm holding up so well; break down with me and admit our shared wretchedness. Don't feign some bright mountaintop; walk with me through the dark valley where neither of us can utter a word." 42. "Thus ressentiment becomes the constituent principle of want of character, which from utter wretchedness tries to sneak itself a position, all the time safeguarding itself by conceding that it is less than nothing. The ressentiment which results from want of character can never understand that eminent distinction really is distinction. Neither does it understand itself by recognizing distinction negatively (as in the case of ostracism) but wants to drag it down, wants to belittle it so that it really ceases to be distinguished. And ressentiment not only defends itself against all existing forms of distinction but against that which is still to come.The ressentiment which is establishing itself is the process of levelling." 43. "No one has learned the meaning of living until he has surrendered his ego to the service of his fellow man. Service to others is akin to duty, the fulfillment of which brings true joy. We do not live alone - in our city, our nation, or our world. There is no dividing line between our prosperity and our neighbor's wretchedness. 'Love they neighbor' is more than a divine truth. It is a pattern for perfection." 44. "A great proportion of the wretchedness which has embittered married life, has originated in a negligence of trifles." 45. "I think of winter, which is nothing but a rift in the firmament through which the winds break loose, the shreds of cloud over the hilltops in the new blue of the morning -- and dew-drops, those false pearls, and frost, that beauty powder, and mankind in disarray and events out of joint, and so many spots on the sun and so many craters in the moon and so much wretchedness everywhere -- when I think of all this I can't help feeling that God is not rich. He has the appearance of riches, certainly, but I can feel his embarrassment. He gives us a revolution the way a bankrupt merchant gives a ball. We must not judge any god by appearances. I see a shoddy universe beyond that splendour of the sky. Creation itself is bankrupt, and that's why I'm a malcontent." 46. "Her eyes were misting over, her heart was talking on her lips. To need everything when everything is finished. She no longer knew whether she was sad or whether it was hunger. To live like that, head bent forward, chin resting down near her breasts, without muscles, without sinews, without vertebrae.She smiled a martyr's smile for her own benefit: for her wretchedness was also a tenderness, and resignation is not the same as oblivion." 47. "To him it seemed a miracle that we should last so much as a single day. There is no antidote, he writes, against the opium of time. The winter sun shows how soon the light fades from the ash, how soon night enfolds us. Hour upon hour is added to the sum. Time itself grows old. Pyramids, arches and obelisks are melting pillars of snow. Not even those who have found a place amidst the heavenly constellations have perpetuated their names: Nimrod is lost in Orion, and Osiris in the Dog Star. Indeed, old families last not three oaks. To set one's name to a work gives no one a title to be remembered, for who knows how many of the best of men have gone without a trace? The iniquity of oblivion blindly scatters her poppyseed and when wretchedness falls upon us one summer's day like snow, all we wish for is to be forgotten." 48. "The closer men came to perfecting for themselves a paradise, the more impatient they became with it, and with themselves as well. They made a garden of pleasure, and became progressively more miserable with it as it grew in richness and power and beauty; for then, perhaps, it was easier to see something was missing in the garden, some tree or shrub that would not grow. When the world was in darkness and wretchedness, it could believe in perfection and yearn for it. But when the world became bright with reason and riches, it began to sense the narrowness of the needle's eye, and that rankled for a world no longer willing to believe or yearn." 49. "There is a degree of wretchedness and want among the lower class of people which is not anywhere so common as among the Spanish and Portuguese settlements." 50. "O, the fierce wretchedness that glory brings us! Who would not wish to be from wealth exempt, Since riches point to misery and contempt? Who would be so mock'd with glory? or to live But in a dream of friendship? To have his pomp and all what state compounds But only painted, like his varnish'd friends? Poor honest lord, brought low by his own heart, Undone by goodness! Strange, unusual blood, When man's worst sin is, he does too much good! Who, then, dares to be half so kind again? For bounty, that makes gods, does still mar men. My dearest lord, bless'd, to be most accursed, Rich, only to be wretched, thy great fortunes Are made thy chief afflictions. Alas, kind lord! He's flung in rage from this ingrateful seat Of monstrous friends, nor has he with him to Supply his life, or that which can command it. I'll follow and inquire him out: I'll ever serve his mind with my best will; Whilst I have gold, I'll be his steward still." The honesty of her plain skin was striking without foundation."